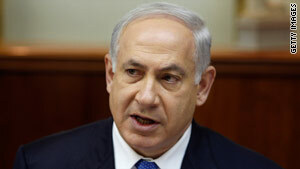 Israeli Prime Minister Benjamin Netanyahu speaks to the Israeli cabinet on Sunday. Jerusalem (CNN) -- Hours after Israeli Prime Minister Benjamin Netanyahu warned the nation would respond strongly to rockets and mortars fired into southern Israel from Gaza, three Palestinians were killed in an Israeli airstrike. The Israel Defense Forces said the three were Islamic Jihad operatives who were about to launch rockets. They included a senior commander who is known to be behind improvised explosive device and gunfire attacks, the IDF said. "The IDF will not tolerate the firing of rockets by terrorist organizations at Israel and will continue to respond against any attempt to disrupt the calm in Israel's southern communities," according to a statement. The deaths occurred east of Deir al-Balah, according to Palestinian sources. At the start of the weekly cabinet meeting, Netanyahu said that 20 rockets and mortar rounds were fired at Israel from Gaza last week. "I regard this very seriously," Netanyahu said. "The IDF responded immediately; it attacked missile-producing factories in the Gaza Strip and tunnels through which Iran smuggles missiles and rockets into the strip. "The government's policy is clear," the prime minister said. "Any firing at our territory will be responded to strongly and immediately." There was no immediate response from Palestinians to Netanyahu's remarks. Earlier Sunday, Palestinian medical officials said two Palestinians were shot dead in northern Gaza, but they were not able to reach the bodies, which were near Israel's security barrier. Israel's military said it was not involved in the incident, according to its initial investigation. Gaza medical officials later said that after searching the area for three hours, they could not find the bodies. Netanyahu warned against words as well as deeds. "It is not only missiles and rockets that endanger security and push peace further off," Netanyahu said. "Words can also be dangerous. Sadly, there has been a retreat in this area in recent months, both within the Palestinian Authority and by its leaders." He said there have been several examples of incitement by Palestinians, and "this is not how peace is made. Peace is made by educating towards reconciliation, by encouraging good neighborly relations and by developing mutual respect." Israel says that more than 300 rockets and mortar shells have been fired from Gaza since the end of Operation Cast Lead, Israel's three-week offensive into Gaza that began December 27, 2008. Israel said the operation was aimed at stopping rocket attacks into southern Israel from Gaza. The operation ended with a cease-fire three weeks later. More than 3,300 rockets and mortars were fired from Gaza in all of 2008, prior to the operation, the IDF said Sunday. There is an ongoing dispute about the number of people killed in that offensive. The Gaza-based Palestinian Center for Human Rights put the death toll at 1,419 and said 1,167 of those were noncombatants. The Israeli military released its own figures last year, saying that 1,166 people were killed, 60 percent of whom were "terror operatives." CNN's Shira Medding, Kevin Flower and Kareem Khadder contributed to this report.